It’s time for another Cute Outfit Ideas of the Week! For this edition, I’m tackling the popular and well loved military style jackets, vests and combat boots. With fall around the corner, it’s time to start thinking about those cooler weather looks and a great military inspired jacket or vest, plus a stylish pair of combat boots is a fun look. Throw on a military style jacket with a lace top for a feminine, yet edgy look. 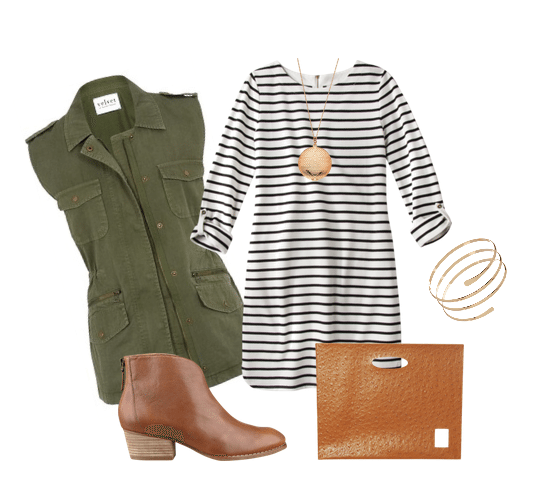 Transition your summer dresses to fall with a military style vest, booties and gold accessories. This Maxi Dress from LOFT is perfect for a military style look. Transition it to fall by adding a black blazer and open toe black booties. Are you ready to try a military inspired look? Check out my other Cute Outfit Ideas for some more fashion inspiration.